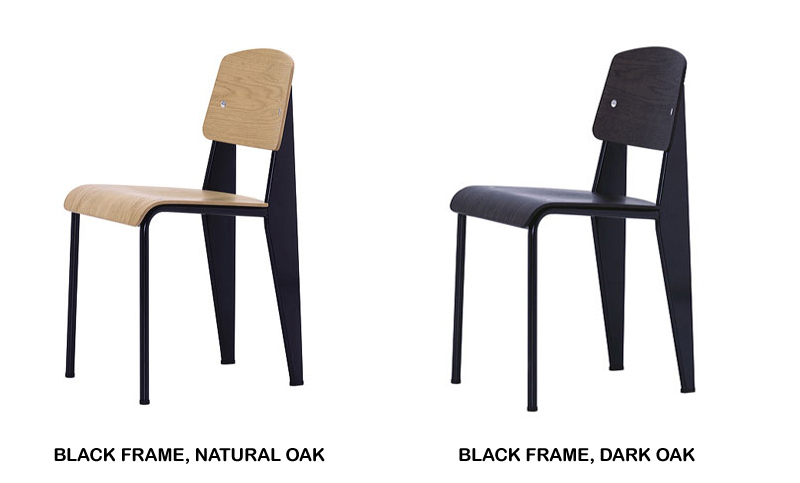 Jean Prouve Standard Chair with black frame and natural Oak seat/back, made by Vitra in Europe. The Vitra Standard Metal & Wood chairs are dining chairs, designed by Jean Prouve, that appeared on the market in 1950s. This classic chair was designed by French designer Jean Prouve in 1952. The Jean Prouve Standard Chair is beautiful modern chair with timeless appeal. The Standard Chair deserves its reputation as a purist masterpiece. The minimal spareness of material and formal elements (less is more) create the fascination of Jean Prouve's Standard Chair. The Jean Prouve Standard Chair is without question one of the most functional modern chairs ever made. The iconic Standard Chair has become a classic icon of modern furniture design. This Jean Prouve Standard Chair is an authentic Vitra re-edition, fully authorized by the Jean Prouve estate. The Standard Chair is an icon of industrial design. Chairs take the most strain on their back legs, where they bear the weight of their user's upper body. Jean Prouve took this into account very succinctly in the Standard Chair. Tubular steel piping is enough for the front legs that take relatively little strain, whereas the back legs are made of voluminous hollow sections which pass the strain on to the floor. Jean Prouve (1901-1984) was a French architect and industrial designer. Jean Prouve is widely recognized as one of the most influential designers of the early modern design movement. Jean Prouve introduced the machine age and industrial engineered modern design aesthetic to interiors in the steel, aluminum and architecture he created. Jean Prouve's functional design stands apart because of its purist and spartan modernist lines. Jean Prouve was once quoted saying "never design anything that cannot be made". Jean Prouve strove for the most construction-sound and materially efficient design solution which is apparent in his design with the Potence Lamp, Standard Chair and Cite Chaise Lounge. Size: 32.75" height x 16.50" width x 19.25" depth. Materials: powder coated steel, wood. This product may have a lead time of 8-12 weeks.